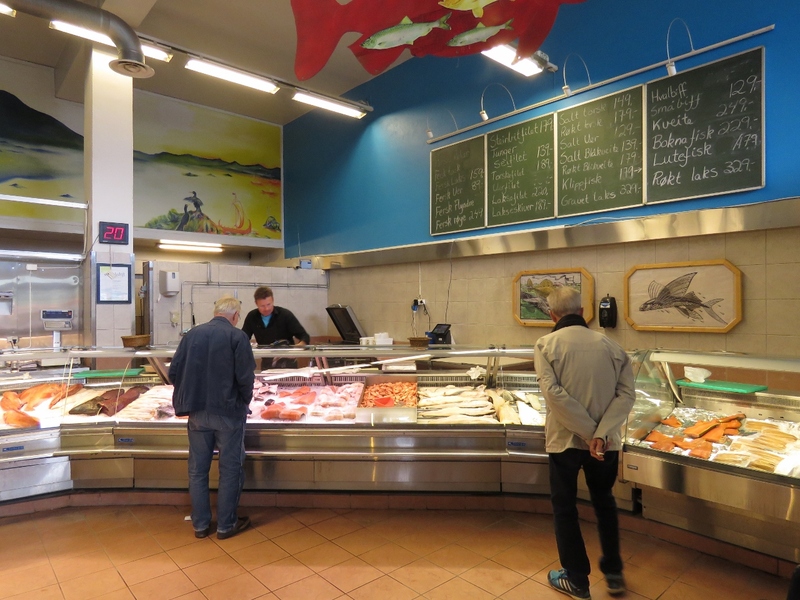 Narvik is ice-free year-round due to the warm waters of the Gulf Stream that run along the west coast of Norway all the way to Svalbard. 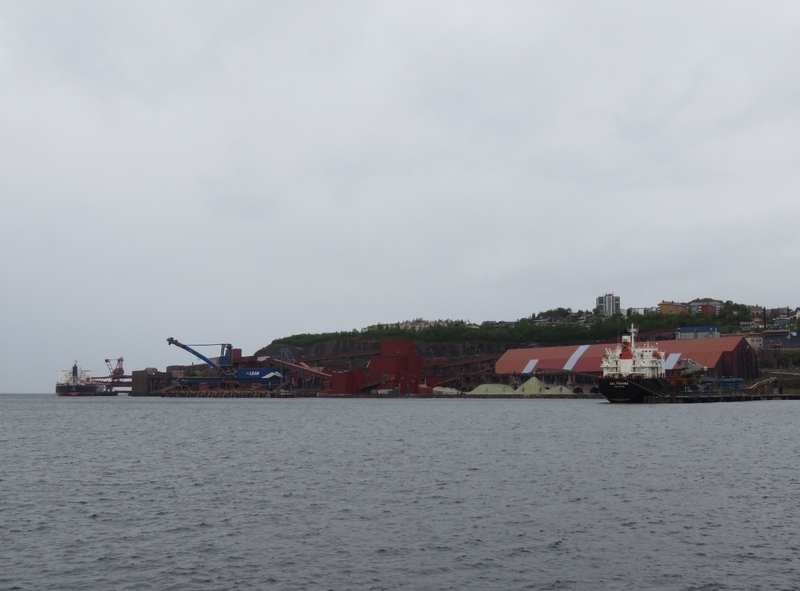 This makes it an ideal shipping port for exporting Swedish-mined iron ore. The scenic Ofotbanen railway that transports the ore from Sweden to Narvik is one of the reasons we visited. 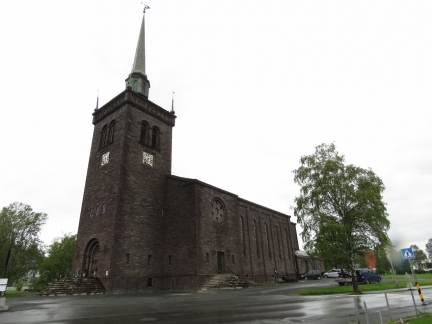 We also were interested in the town’s World War II history. 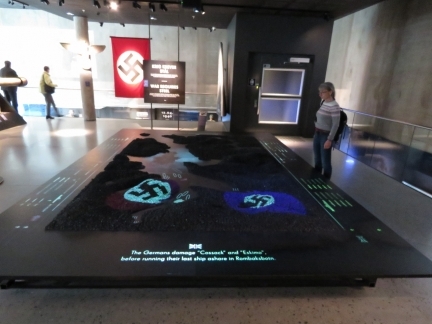 Thirty-four ships were sunk and hundreds of lives lost in the Battles of Narvik as Britain and Germany fought for control over the port and its access to the valuable iron ore. Narvik’s modern new War Museum opened in 2016 and has excellent displays detailing the World War II Battles of Narvik, the impact of the war on the area and war in general. 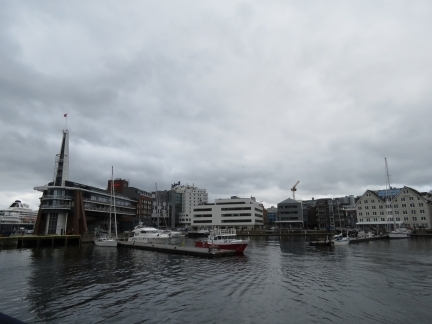 A last look at Tromsø Haven before we depart for points south. We had an excellent two-week stay. 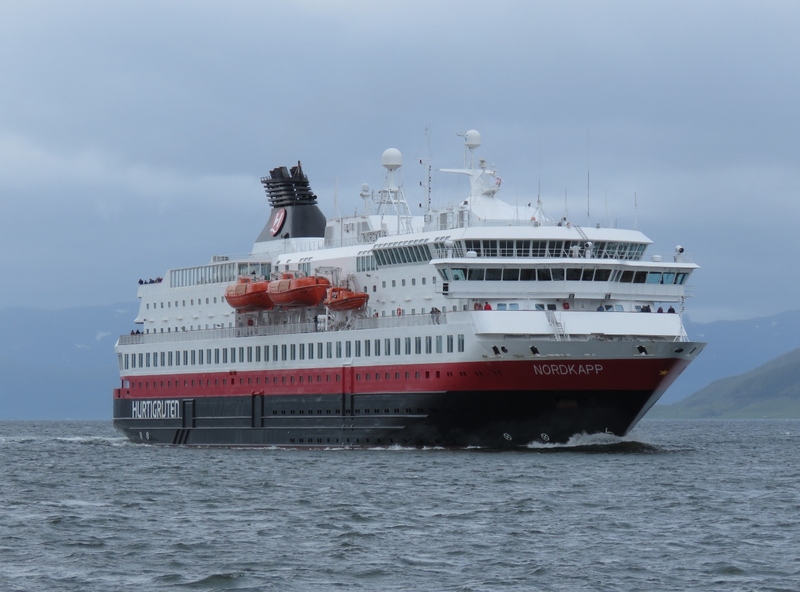 The Hurtigruten Nordkapp heading north to Tromsø. 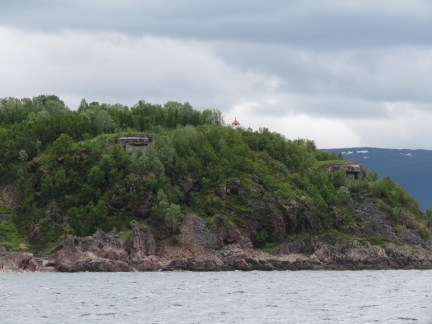 Coastal fortifications on the hill at we run south near Ansnes. 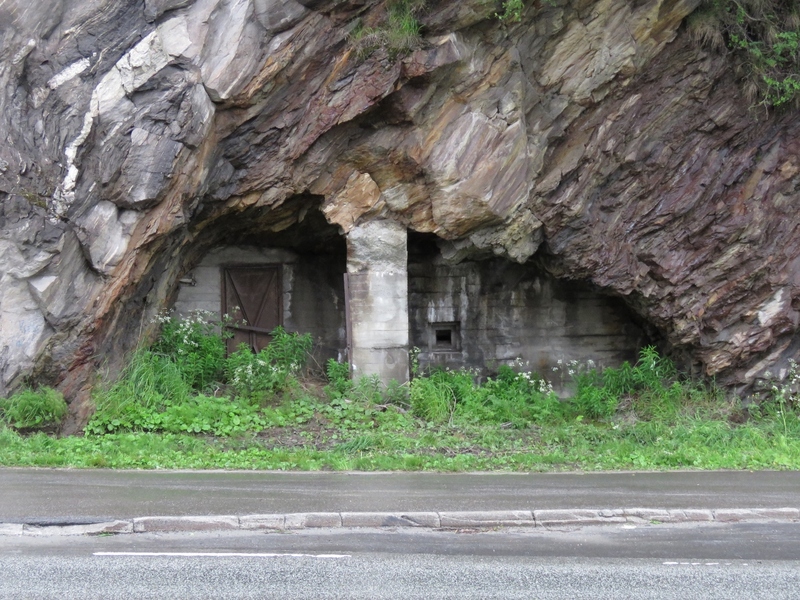 These likely were built by Germany during their occupation. 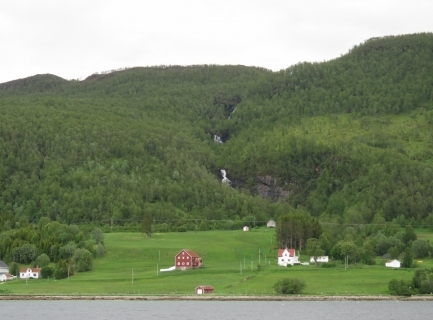 Waterfall and lots of green along the west shore at the north emd of the channel Gisundet along the west coast of Senja. 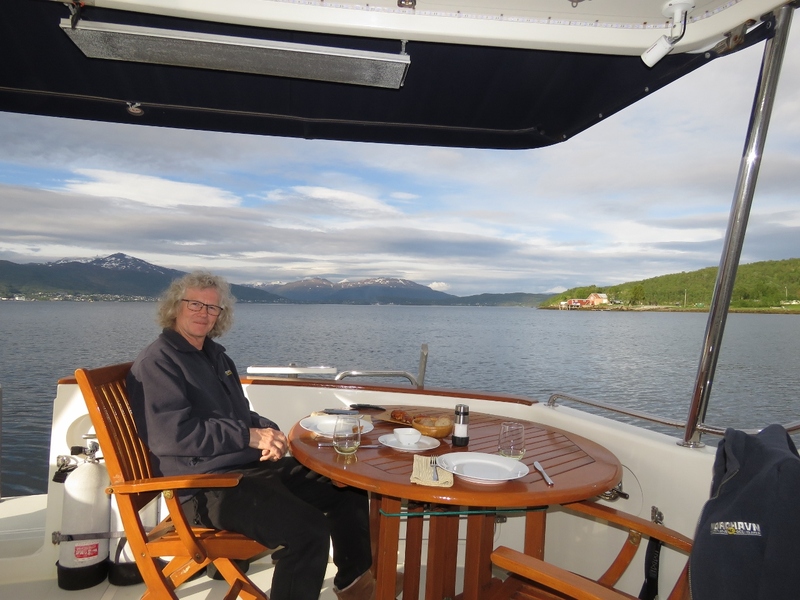 A relaxing dinner on deck at Vågan with a view north toward Finnsnes. 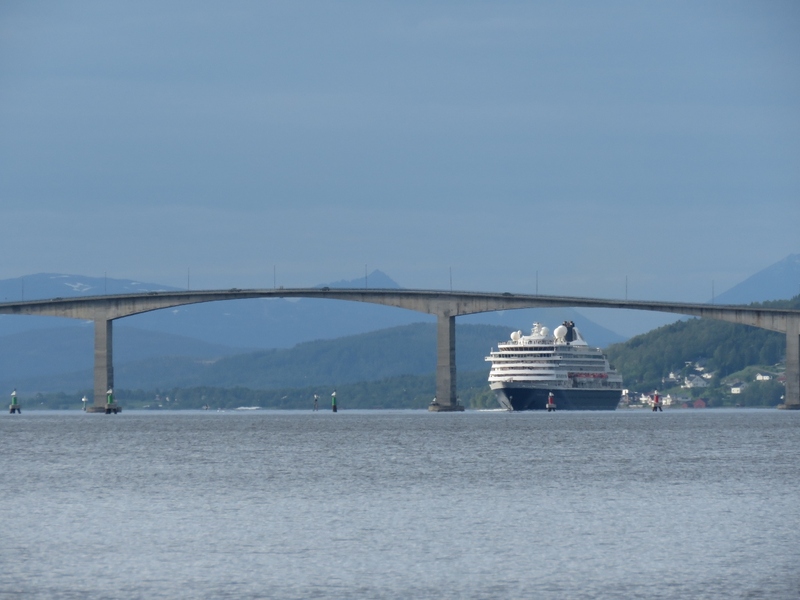 The cruise ship Prinsendam, that we saw on our Hurtigrten trip, running south off Finnsnes. The Hurtigruten Lofoten, viewed from our anchorage at Vågan, heading south after a 4:45am departure from Finnsnes. 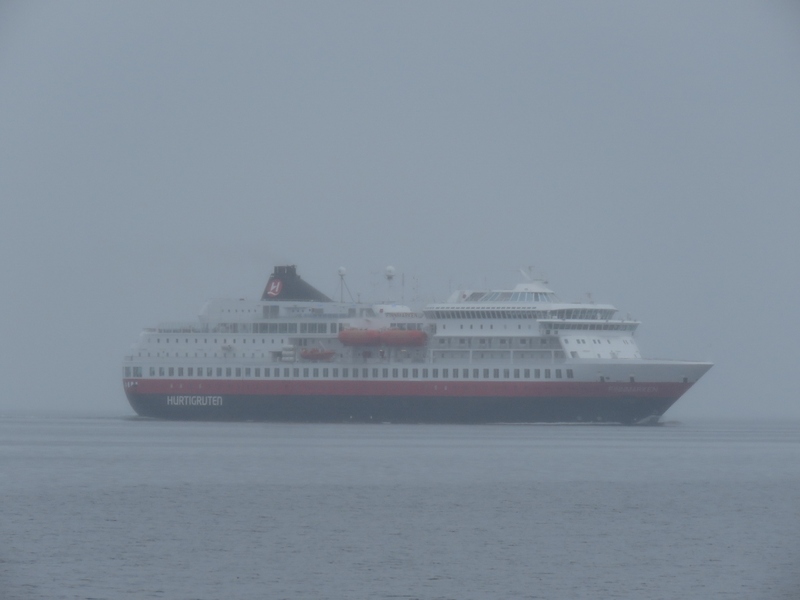 The Hurtigruten Finnmarken running north for a 11:00am arrival into Finnsnes. 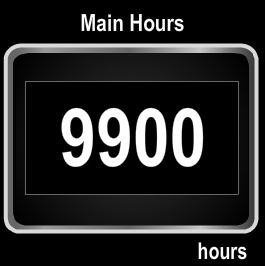 We just reached 9,900 hours on our John Deere 6068AFM75. This engine has been impressively good and, in 7 years and over 9,900 hours, it’s had almost nothing other than standard consumables/replacement items like oil filters. The Cam Position Sensor was replaced during warranty at under 1,000 hours (probably just a bad connection) and the injectors were changed at 9,522 hours. This 266 HP Deere 6068 has simply been amazing and continues to operate with absolute no evidence of any wear as we near 10,000 hours. 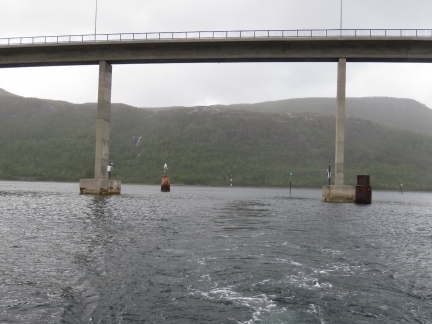 Rocks don’t usually move, but we’ve found several places in Norway where islands or rocks are have been moved. 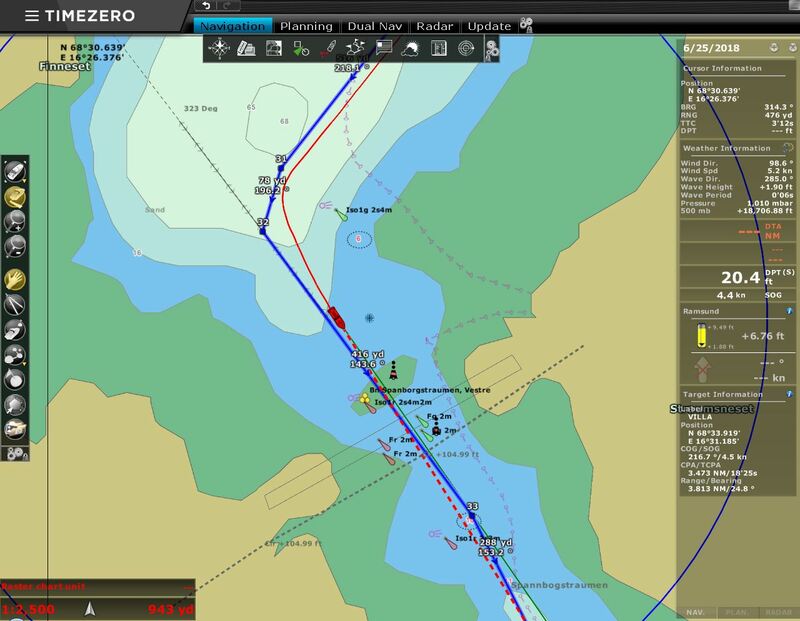 Our older charts show a drying section just north of the bridge across the channel Ramsund, but the newer charts show depths of at least three meters through this area where a deeper channel has been blasted out. 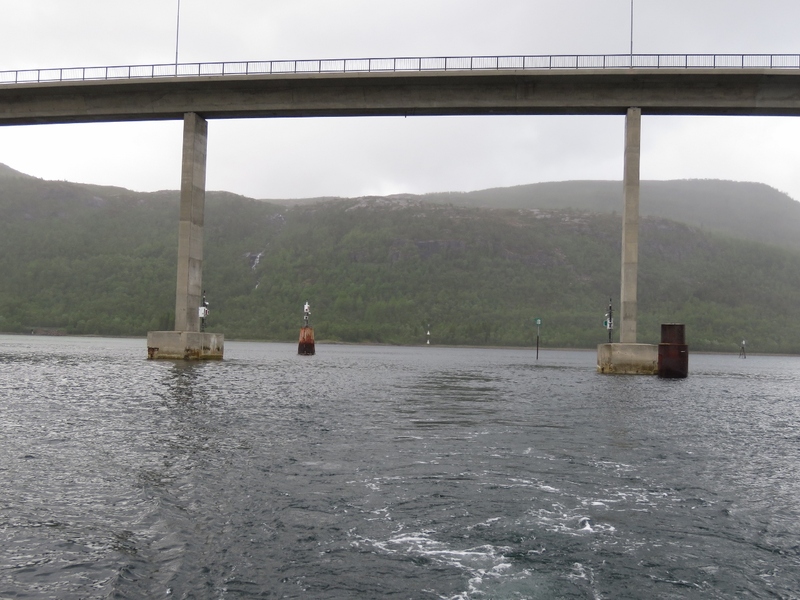 Looking back to the multiple markers guiding us past shallows and under the bridge across Ramsund. 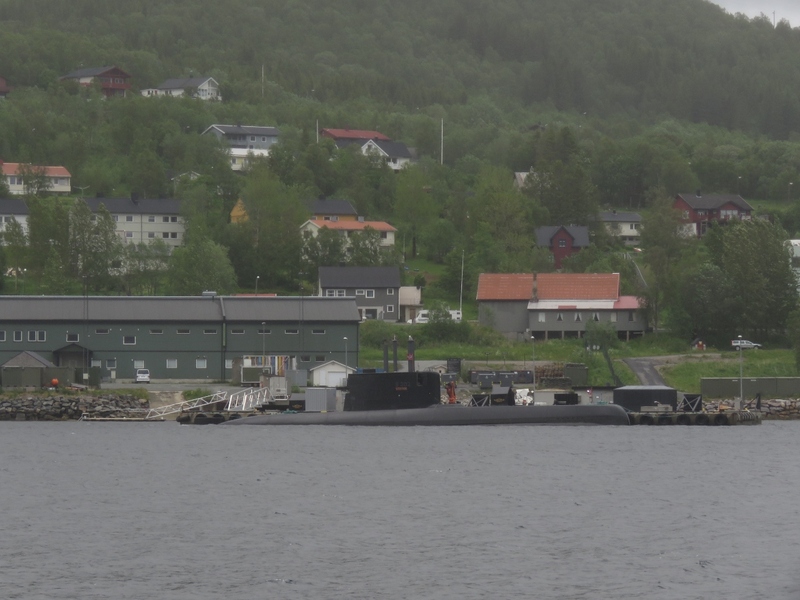 Submarine moored at Ramsund Naval Base to our east. Pleasure craft can now pass through the formerly off-limits military zone in the channel Ramsund, but are not allowed to stop anywhere in the restricted area. The Norwegian Maritime/Special warfare unit, Marinejegerkommandoen, is based at Ramsund Naval Base. 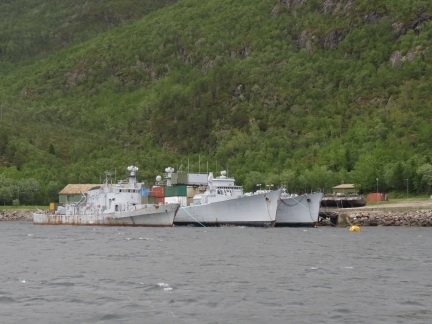 Several high-speed landing-craft painted with camouflage are ashore to the right of the ships. The view as we arrive in Narvik to the city’s reason for being: the LKAB iron ore shipping terminal. Narvik is ice-free year-round due to the warm waters of the Gulf Stream that run along the west coast of Norway all the way to Svalbard. 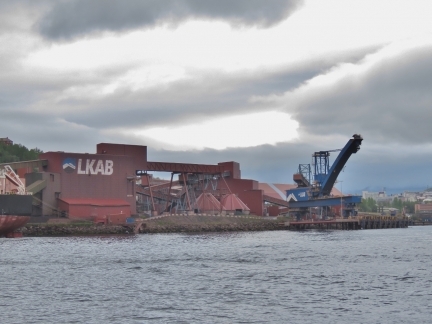 This makes it an ideal port to ship the iron ore that LKAB mines in Sweden. 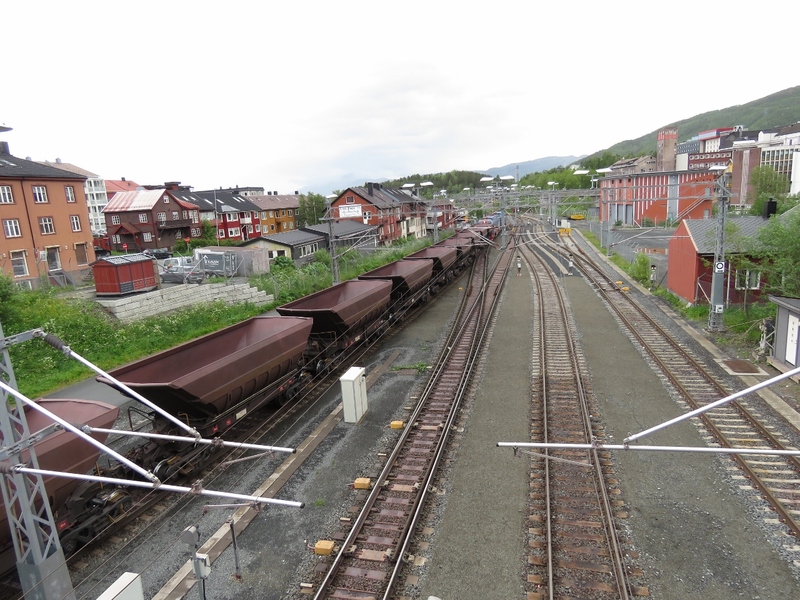 The scenic Ofotbanen railway that transports the ore from Sweden to Narvik is one of the reasons we’re here. MS Skogøy was launched in 1953 and ran coastal routes for the Ofotens Steamship Company, based in Narvik. 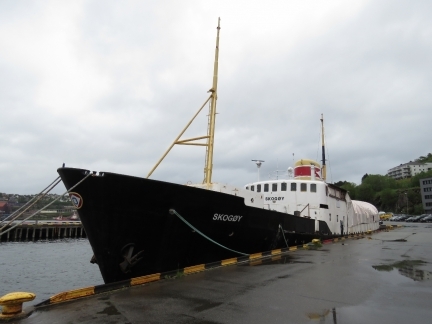 The ship was sold out of the country to Sweden in 1983 and eventually foundered in 2009. 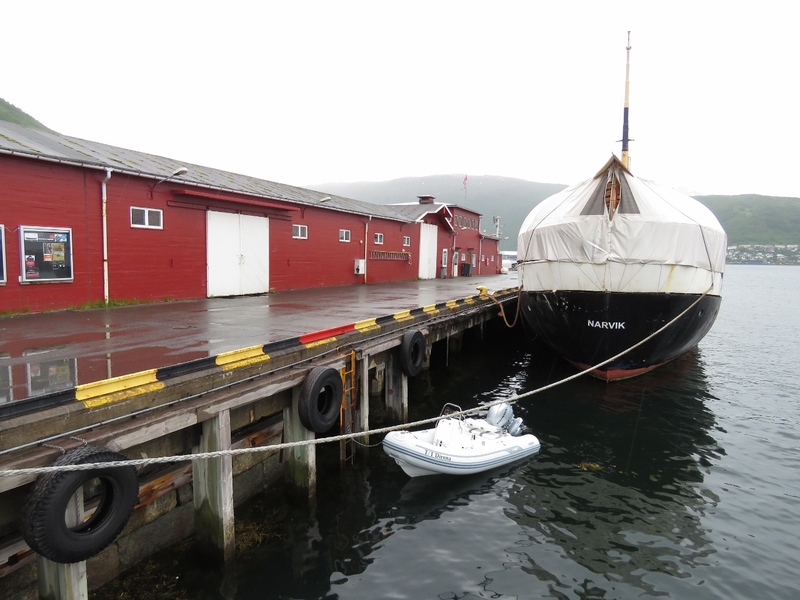 A group of local enthusiasts purchased the ship and brought it back to Norway in 2012, where it is being restored. The tender tied off behind Skogøy in the Narvik commercial docks. A view from shore to the massive LKAB iron ore shipping terminal—it dominates the town. Narvik is full of sculptures, many related to World War II. 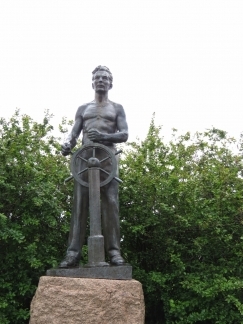 This unnamed one might be in memory of merchant mariners who lost their lives. World War II air raid shelters built into the rocks near the port of Narvik. 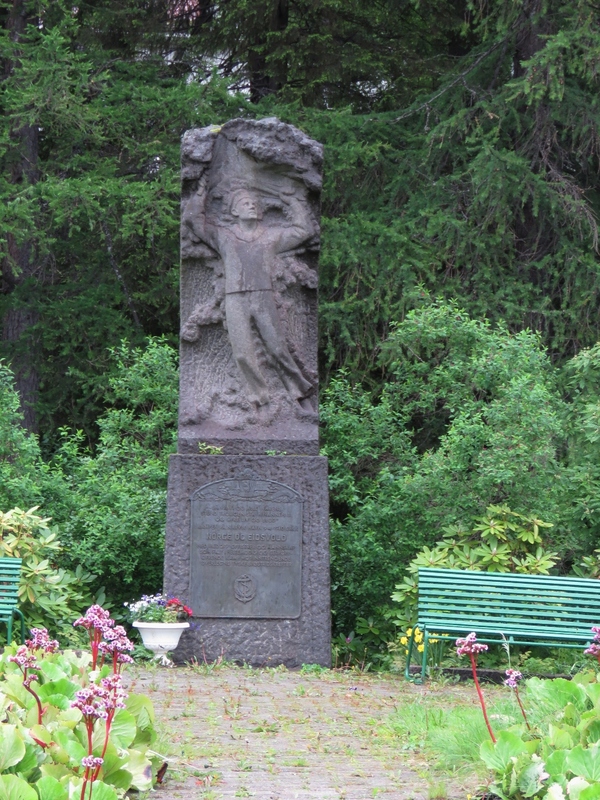 A memorial to those lost in HNoMS Norge and HNoMS Eidsvold which were sunk Apr. 9, 1940 in Narvik Harbor during the German invasion. (HNoMS means “His/Her Norwegian Majesty’s Ship”). Another unnamed statue in downtown Narvik depicting two women leaning into the wind. It apparently can get pretty blustery here. 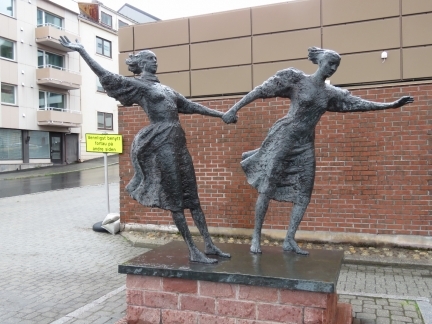 The peace sculpture Life out of Chaos in downtown Narvik was created by Narvik’s sculptor Gunnar Olaf Finn Eriksen and unveiled in 1956. We had a good, and very fresh, seafood meal at Fiskehallen, a cafe attached to a fish market. In World War II, Germany and the Allies fought fierce battles for control of the ice-free harbour at Narvik with it’s access to the valuable iron ore from Sweden. 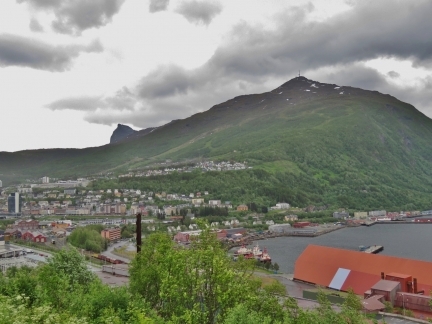 The Battles of Narvik were fought between April 9-June 8, 1940. 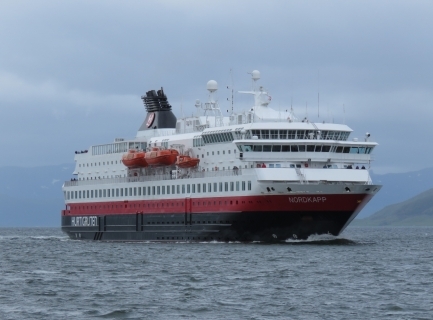 34 ships were sunk and hundreds of lives lost. Narvik’s modern new War Museum opened in 2016 and has excellent displays detailing the World War II Battles of Narvik, the impact of the war on the area and war in general. 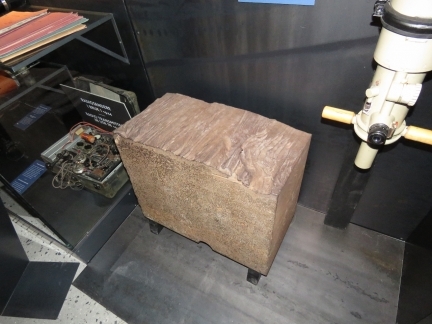 Section of the armoured plate from the German warship Tirpitz. 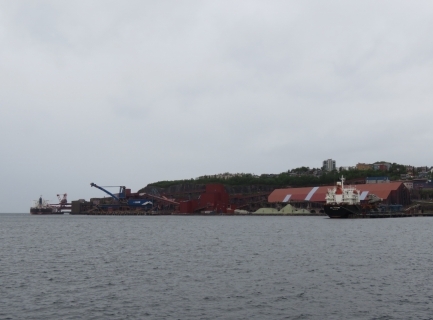 The massive and modern warship, covered with near-impenetrable armoured plates and huge cannons, was one of the most feared on the Arctic Front. The Allies eventually sunk the Tirpitz not far from where we anchored the night before arriving into Tromsø. 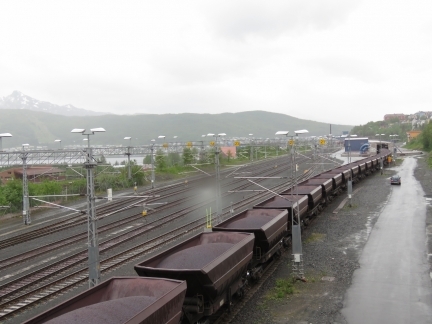 Empty ore carts heading out on the Ofotbanen Railway toward Sweden from the LKAB terminal. Dirona at anchor along the east shore of Narvikbukta, viewed from above the LKAB terminal. 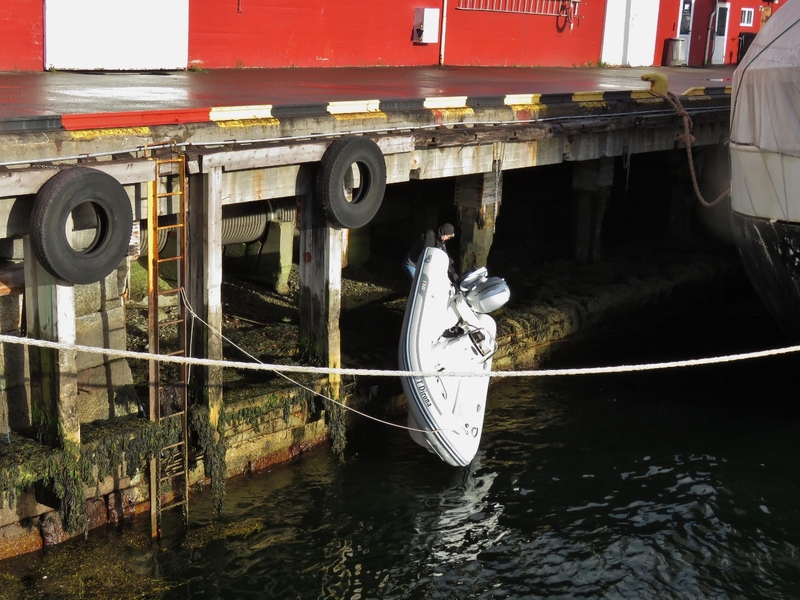 The local marina is too shallow for us, so we anchored in the large harbor instead. Swell from Ofotfjorden does reach the anchorage, but it worked well for our visit to Narvik. 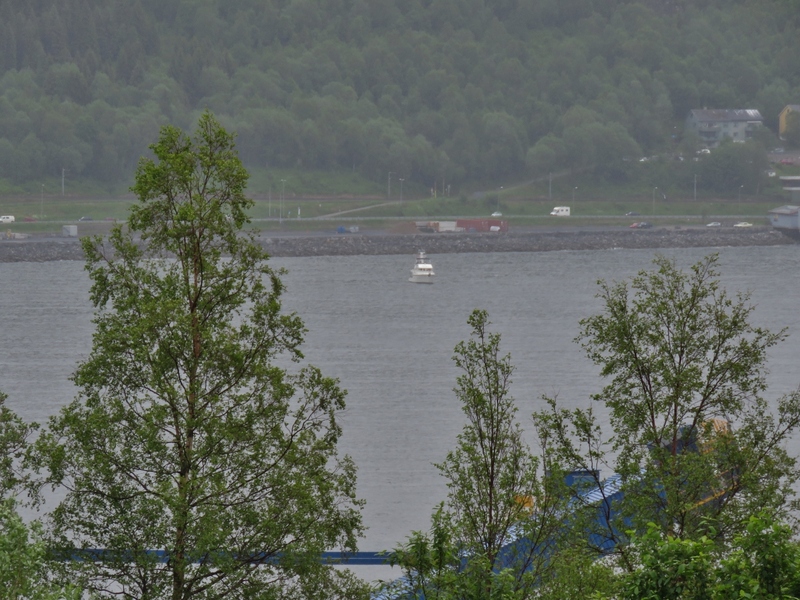 The view northeast across Narvik. 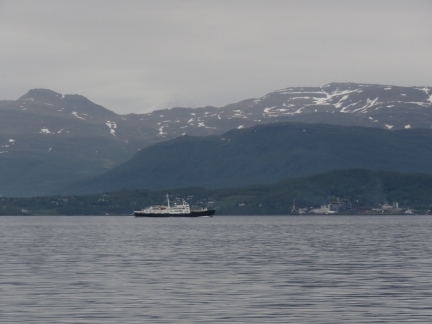 Our tender, not visible, is moored behind the Skogøy at the right of the picture. 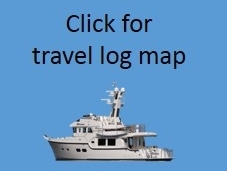 Our anchorage is farther to the right, outside the shot. Narvik Kirke, built in 1925, fortunately managed to survive the World War II battles. Iron ore arriving from LKAB’s mine in Kiruna, Sweden. 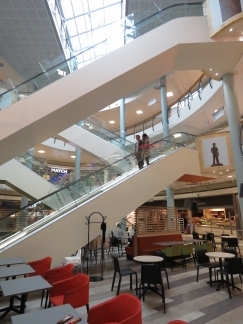 A pass through Narvik’s downtown mall. We returned to the harbour to find our tender stranded on a shelf that wasn’t visible below the water when we landed with at least three hours before the tide would float it again. What to do? 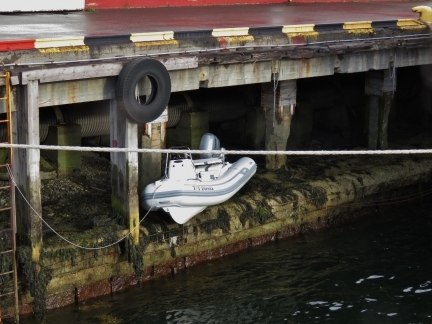 James managed to slide the 700-pound (370 kg) tender over to the edge and push it in to get us floating again. A short video showing the process is at https://www.youtube.com/watch?v=YPinTB5XBFM. 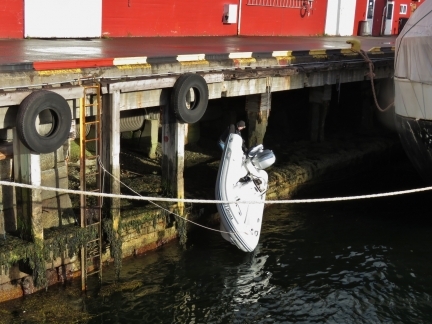 At the end, James is indicating that the splash of landing has almost filled the tender.